How About Those New York Jets! The first three games of the wild-card weekend — the third best weekend in sports, supposedly — were dreadful, sloppy affairs in which one team clearly came in breathing smoke from the nose (the Jets, the Cowboys, the Ravens) and the other looked like someone woke it from a nap before it was ready (the Bengals, the Eagles, the Patriots). Those type of games are right up the Jets' alley: eyesores, a team jumping out to a lead early and handing the ball off for two hours. And then came the Cardinals-Packers game. That game might not have been as historic a game as it was purely entertaining, but it's what many prognosticators thought how the postseason would play out. It was high-scoring, chaotic, and The Future of the NFL. The axiom that Defense Wins Championships is a coffee-mug-slogan-level mantra at this point, but you can make a strong case that it's not true. Of the eight teams left in the playoffs, six of them are openly offense-oriented, and considering the two that aren't, the Jets and Ravens, scored a combined 57 points this weekend, it's not like they're three yards and a cloud of synthetic turf either. It still has to make one feel a tad bit nervous about the Jets chances going forward. In low-scoring games, your margin for error is even smaller. On a perfect planet, the Jets could take a 10–3 lead and just hide the ball somewhere in Rex Ryan's neck. But in a passing, scoring, Arena Football league, not only do you have to click the scoreboard repeatedly, a tiny mistake can destroy your whole game plan. As nice as Mark Sanchez has been playing lately, he's not going to pull what Kurt Warner and Aaron Rodgers did yesterday. If the Jets can win like the Ravens did, with their quarterback going 4-of-10 for 34 yards and an interception, more power to them. But nobody thinks they can win like that, not against San Diego, currently the hottest team in football. 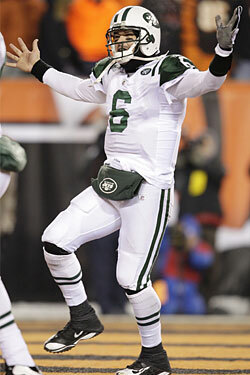 This is all to say: The more entertaining the games, the less likely the Jets are to win them. Here's to boredom, in 2010.